ZigBee is a low-cost, low-power, wireless mesh networking standard. The low cost allows the technology to be widely deployed in wireless control and monitoring applications, the low power-usage allows longer life with smaller batteries, and the mesh networking provides high reliability and larger range. The name "ZigBee" is derived from the erratic zigging patterns many bees make between flowers when collecting pollen. This is evocative of the invisible webs of connections existing in a fully wireless environment. The standard itself is regulated by a group known as the ZigBee Alliance, with over 150 members worldwide. ZigBee devices are actively limited to a through-rate of 250Kbps,compared to Bluetooth's much larger pipeline of 1Mbps, operating on the 2.4 GHz ISM band, which is available throughout most of the world. devices is 250 feet (76m), substantially further than that used by Bluetooth capable devices, although security concerns raised over "sniping" Bluetooth devices remotely, may prove to hold true for ZigBee devices as well. communicating with one another freely and regulating common tasks seamlessly. We’re beginning to hear more and more about this wireless technology called ZigBee. A catchy name for sure, but what is it and who needs it? We already have Bluetooth- and Wi-Fi-enabled devices, and WiMAX and Wireless USB proliferation are at the doorstep. Who needs another wireless standard? First, let’s understand that each wireless technology that makes it to market serves a special purpose or function. Bluetooth and wireless USB provide short-range connectivity in what is called a personal-area network (PAN). Bluetooth serves a short-range, moderate-speed, wire replacer, and wireless USB provides short-range, high-speed device connectivity. Wi-Fi is for local-area networks (LANs) and WiMAX is designed to provide wide-area networking (WAN) or metropolitan-area networking (MAN). ZigBee fills yet another nitch. It is a PAN technology based on the IEEE 802.15.4 standard. Unlike Bluetooth or wireless USB devices, ZigBee devices have the ability to form a mesh network between nodes. Meshing is a type of daisy chaining from one device to another. This technique allows the short range of an individual node to be expanded and multiplied, covering a much larger area. One ZigBee network can contain more than 65,000 nodes (active devices). The network they form in cooperation with each other may take the shape of a star, a branching tree or a net (mesh). What’s more, each device can operate for years off of a AA cell. That means that each node uses little power. What might be perceived as a disadvantage is the low data rate of ZigBee devices, typically less than 100 kbps, depending on the selected frequency band. Is slow bad? That depends on the function or service the technology is intended to provide. That brings us to the opening question: Who needs ZigBee? If you are looking for wireless monitoring and remote control solutions, ZigBee may be the answer. Those are the functions for which ZigBee was designed. ZigBee nodes can be used to tie an entire home, office or factory together for safety, security and control. 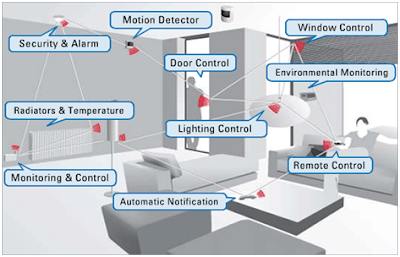 Nodes are embedded in hundreds of sensors and controls that are built into large infrastructures for home automation, industrial automation, remote metering, automotives, medical equipment, patient monitoring, asset tracking systems, security systems, lighting and temperature control systems, and even toys. ZigBee Network Coordinator. Smart node that automatically initiates the formation of the network. ZigBee Router. Another smart node that links groups together and provides multi-hoping for messages. It associates with other routers and end-devices. ZigBee End Devices. Where the rubber hits the road—sensors, actuators, monitors, switches, dimmers and other controllers. 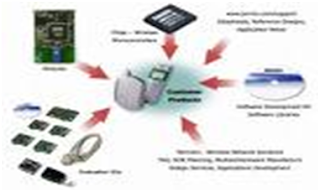 ZigBee networks provide smart, low-cost, low-power, low-maintenance monitoring and control systems. ZigBee offers unique advantages for wireless applications. But with a technology this new, realizing a successful ZigBee wireless implementation requires understanding its architecture and operation, assessing design options at the chip and module level, and weighing practical considerations relative to specific application needs. ZigBee is the product of the ZigBee Alliance, an organization of manufacturers dedicated to developing a networking technology for small, ISM-band radios that could welcome even the simplest industrial and home end devices into wireless connectivity. The ZigBee specification was finalized in December 2004, and products supporting the ZigBee standard are just now beginning to enter the market. To minimize power consumption and promote long battery life in battery-powered devices, end devices can spend most of their time asleep, waking up only when they need to communicate and then going immediately back to sleep. ZigBee envisions that routers and the coordinator will be mains-powered and will not go to sleep. To illustrate how these components interrelate, consider ZigBee networking in office lighting. Several manufacturers are currently developing inexpensive sensors for fluorescent tubes that let lights be turned on and off by battery-powered wall switches, with no wires between switch and fixture. The light switch is the end device, powered by a button cell battery that will last for years; the switch wakes up and uses battery power only when flipped on or off to transmit the new state to the fluorescent tubes' routers. The routers are already connected to the mains and are not concerned with battery conservation. Any one of the fluorescent tubes can contain the coordinator. The implications are enormous for new office construction — no more electrical runs for lighting and the ability to reconfigure lighting controls at almost zero cost. The typical ZigBee radio is cost-effective. Chipset prices can be as low as $12 each in quantities as few as 100 pieces. While the 802.15.4 and ZigBee stacks are typically included in this cost, crystals and other discrete components are not; design-in modules fall in the neighborhood of $25 in similar quantities. This pricing provides an economic justification for extending wireless networking to even the simplest of devices. 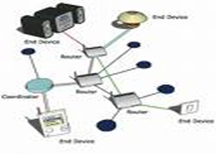 ZigBee routers double as input devices and repeaters to create a form of mesh network. If two network points are unable to communicate as intended, transmission is dynamically routed from the blocked node to a router with a clear path to the data's destination. This happens automatically, so that communications continue even when a link fails unexpectedly. The use of low-cost routers can also extend the network's effective reach. When the distance between the base station and a remote node exceeds the devices' range, an intermediate node or nodes can relay transmission, eliminating the need for separate repeaters As an open standard, ZigBee provides customers with the ability to choose vendors as needed. ZigBee Alliance working groups define interoperability profiles to which ZigBee-certified devices must adhere. A ZigBee-certified radio will interoperate with any other ZigBee-certified radio adhering to the same profile. This promotes compatibility and competition, which allows the end users to choose the best device for each particular network node, regardless of manufacturer. Basic ZigBee radios operate at 1 mW RF power and can sleep when not involved in transmission (higher RF-power ZigBee radios for applications needing greater range also provide the sleep function). Because this makes battery-powered radios more practical than ever, wireless devices are free to be placed without power cable runs in addition to eliminating data cable runs. For purposes of this discussion, three areas of architectural responsibility are in a ZigBee engineering effort . The physical and MAC layers take full advantage of the physical radio specified by IEEE 802.15.4. The 802.15.4 specification describes a peer-to-peer radio using direct-sequence, spread spectrum (DSSS). The specification also calls out the data rates, channelization and modulation techniques to be employed. The ZigBee Alliance specifies the logical network, security and application software, which are implemented in a firmware stack. It is the ZigBee networking stack that creates the mesh networking capability.Each microcontroller /RF chip combination requires its own ZigBee stack due to the differences in microcontrollers and RF chips. Typically, the ZigBee stack is included with either the microcontroller or RF chip. The stack may belong to the chip vendor, be provided by the chip vendor from a third-party source, or be provided by a third-party source for a specific microcontroller/RF Chip combination. until there are three vendors that have implemented the profile. In the end, decisions regarding ZigBee hardware/firmware, profiles and certifications depend on practical decision points that must balance what you want of your product with what's available today. Ultimate control over product details is achievable with a custom design around a ZigBee-compliant chipset. This method carries high up-front costs in RF and digital engineering, plus investments in test equipment and test fees, and will typically encounter the longest time to market. It may also yield the lowest recurring per-unit cost; if manufacturing quantities are sufficiently high and if time to market is not critical, this is an advantageous method. There are many specifics to be considered among the product resources available to you, and they and the dynamics that govern engineering choices will change as the ZigBee standard matures. To help make the best-informed decisions, you are encouraged to visit www.zigbee.org for further discovery. 2. "ZigBee Specification Download Request". Retrieved on 2008-03-18. 3. Adams, Jon; Bob Heile. "Busy as a ZigBee". IEEE. Retrieved on 2007-01-16. 5. "WLAN Interference to IEEE802.15.4". Retrieved on 2007-11-22.